I love Kage Baker’s books. She wrote the Company series, a handful of humorous fantasy novels, and a bucket of short stories, all with her signature brand of humor, wit, and pull-you-right-in writing style. Her career was cut short when she passed away from cancer in 2010. Her books have become hard to find, so every time I am in a used bookstore I head right to the “B” section and buy everything they have of hers that I don’t already own. 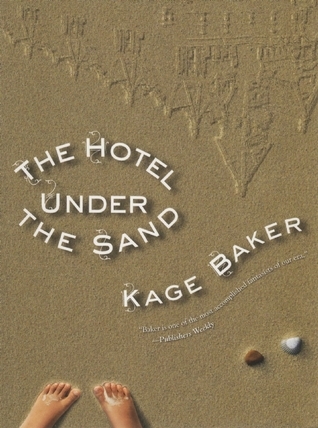 The Hotel Under the Sand was published by Tachyon in 2009, and is her only known work for children and middle grade readers. This novella has a similar feel to Un Lun Dun by China Mieville, except it is all around happier and sunnier. Young Emma has survived a shipwreck and washed up onto a beach. As she is exploring the island, she meets a ghost named Winston. He is the Bell Hop Captain of the famous Grand Wenlocke hotel, and might young Emma have any luggage he can carry for her, or shoes he can shine? You see, decades ago, a wealthy man by the last name of Wenlocke started work on a massive resort on these famous sand Dunes. Adding to the allure and magic of the resort, this would be a resort where time stands still. Thanks to a time engine in the basement, guests are encouraged to stay as long as they please! Months, years! When they leave to go back home, only 2 weeks will have passed. Perhaps the project was doomed from the start, as just before the hotel was due to open a huge storm came and swept it under the sands, taking Winston with it. where I got it: have owned it forever. I’ve been reading Manga on and off for probably ten years. I don’t mention manga much, because there are very few series I’ve liked enough to invest in. One of the early reviews on this blog was for the first volume (or first few? I can’t tell) of xxxHolic, by CLAMP. The Manga section of Barnes and Noble is full of 3 volume omnibuses these days, but back in the old days, a three volume omnibus was an oddity. No one planned to make more than one of these monsters, so sometimes there wasn’t even a number on the spine. And speaking of “way back when”, xxxHolic has been floating around in one form or another since 2004 or there abouts. I wrote a halfway decent review of this back in 2010, it’s nice to see I did a decent job of writing a plot based review! It’s interesting to see what I got out of xxxHolic then, and what’s I’m getting out of it now. The surface stuff is always the easy stuff – Yuko’s hidden “shop”, the crossover plotlines and funny little jokes from other CLAMP works, the “monster of the week” episodic feel of these first three volumes, the gorgeous artwork. If you’re used to American style graphic novels, Japanese manga, CLAMP works especially, may be a shock to you – everything is in black and white, there is far less dialog per page, motion is depicted very differently, and the human body is drawn differently than you might be used to. Back in the day, I stalled out six or seven volumes into xxxHolic, I felt the story wasn’t really going anywhere. At the time, seven volumes was a pretty big investment to make in a series if I wasn’t going to continue. Yuko might be the space time witch who offers to help Watanuki get rid of his spirits problem, but I needed more than just urban fantasy slice of life. I didn’t continue reading it, but my husband did, eventually trading in our single volumes for these hefty 3-volume omnibuses. And he let me know the story gets deeper, deadlier, and darker. So now I want to give it another try, because I like all of those things! Watanuki might be getting dragged on Yuko’s errands, but it’s important later for him to have safely been exposed to all this urban fantasy type stuff. Even at the ghost story telling ceremony with Domeki, Watanuki might might not feel safe, but if Yuko is in the room she’ll never let anything permanent happen to him. Or at least I don’t think she’d let anything happen to him . . . 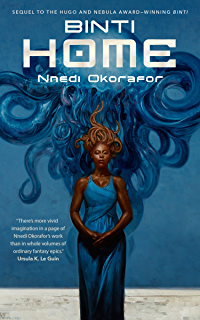 In my review for Okorafor’s first Binti novella, I was hopeful that she’d write more fiction starring this character, and that the first novella was just Binti’s initial adventure into the galaxy. My hopes for Binti were that she’d continue to meet new people and expand her worldview. In Binti:Home, Okorafor has chosen a much scarier adventure for the now more worldly Binti. After a year at University, she’s headed home for a traditional pilgrimage. A young woman who ran away from home in the middle of the night to chase her dreams, a young woman who has been physically and mentally changed by surviving a Meduse attack on her ship, and is who is now friendly enough with a Meduse to bring him home with her. What does her family think of her now? This is a most unusual book review, because I am not going to tell you the name of this book, the name of the author, or the year the book was written. You don’t get any cover art either. We all judge books by their covers and all that, so I’m curious what everyone’s thoughts will be if I tell you everything you need to know about the book except what you’d see on a bookstore shelf. A deliberate experiment, if you will. And don’t worry, I’ll reveal the author and cover art in a few days. 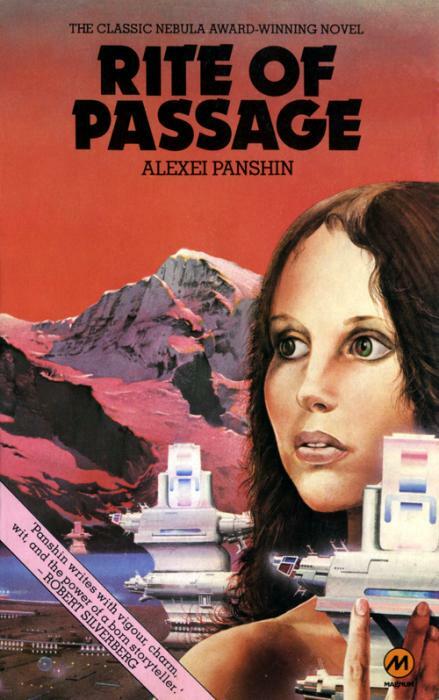 For those of you who recognize this book, or think you do, please, please don’t reveal the book’s title in the comments. Are any of you familiar with the anime TV shows Sword Art Online or Log Horizon? In these shows, gamers get transported into the world of their MMO video game, and have to survive. This book has a similar, if simplified premise. A bunch of college kids are in a table-top Role Playing Game club, with a professor as their game master. I won’t get into the how’s or why’s, but the professor is able to transport the students to the fantasy role playing world, and the students have to survive. What’s really neat here is that while everyone comes through into the fantasy world as their characters (a cleric, or dwarf, or thief, etc) and with the skills and attributes (strength, speed, dexterity, etc) from their character sheet, they also retain all their knowledge and morals from the real world. One woman depends on her real world travel experiences to help her haggle with traders, there’s even some “innovative” WWF style fighting moves that no one else in the arena had ever seen. At it’s heart, this is a coming-of-age fantasy quest story . 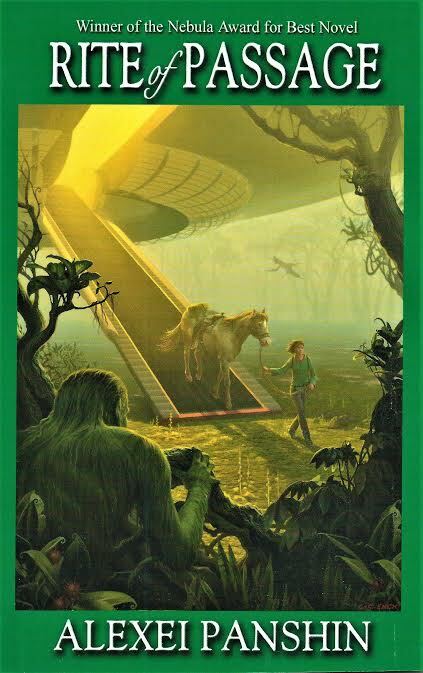 The goal is to find the gate between worlds, so they can get home to the real world. But, as we learn, not everyone wants to go home. Sure, home has modern dentistry, and cars, and our parents, and health insurance. But one guy, if he goes home, the only thing waiting for him is his wheelchair and people pitying him. Here, in the fantasy world, he can walk. He can do all the things he can’t do at home. Another character, this is the first time in his life he’s respected for his knowledge and abilities. If he goes home, it’s back to being the guy everyone makes fun of. It was neat, how some characters abandon their real world first names right away to only go by their fantasy role play character names, and how others never take on their characters names because they don’t want to be these fantasy world characters, and how others have an internal conflict as to who they are because they have a compelling reason to be a little bit of both. The author presents the character’s inner conflicts with subtlety. The author doesn’t shy away from tough subjects either. Like another very popular series, main characters die – usually in shockingly awful ways. Up In The Air and The Devil Wears Prada are basically the same movie, and they aren’t what you think they’re about. I adore Anna Kendrick, and I’ve seen Up in the Air about 10 times. I laugh at all the travel scenes, because I’ve been there done that (and the St Louis airport has some surprisingly nice restaurants). Up In the Air is a good, but not great movie. And with The Devil Wears Prada who can say no to an all-star cast of Anne Hathaway, Meryl Streep, Stanley Tucci, and Emily Blunt? So these are obviously two really fun movies for me. These two movies are supposed to coming of age stories about young women who chase a dream career and blah blah blah . . .
Coming of age story? Yeah, well, they aren’t about that at all. Imma gonna spoil the plots for you, okay? Both movies have nearly identical plots, that among other things, are pretty predictable. So I don’t feel like I’m actually spoiling anything important here. Fifteen to twenty years after the events of Swordspoint: Alec is now the Duke Tremontaine, Richard St. Vier is nowhere to be found, and old grudges are still burning. But on the bright side, Riverside is slightly safer. Seemingly out of the blue, Duke Tremontaine sends for his niece Katherine. She is to live with him for six months, and have no contact with her mother and brothers during that time. Katherine, raised at her family’s country estate, is expectedly naive. And why she know anything about the outside world? She’s been raised as a young lady of quality, given the tools she needs to secure a proper marriage. Titles and marriages however, do not guarantee financial stability, and Katherine spends much of her time identifying what can be sold for cash and hemming her own clothing. Even so, she still dreams of visiting the city, having a season full of lace and dresses and balls and then getting married to someone who loves her. This is what she’s been raised to expect and look forward to because no one has told her otherwise. Your assumptions? I see them. Observe, as Ellen Kushner smashes them into itty bitty pieces. 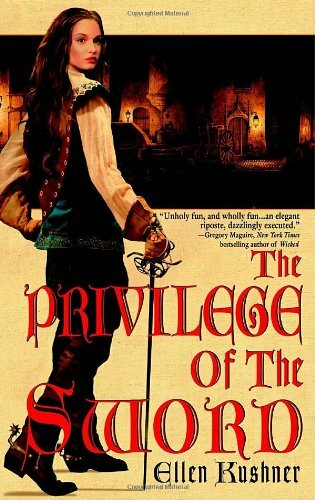 When Katherine arrives at the Duke’s home, she finds only men’s clothing waiting for her, her uncle’s strange, strange friends, and daily fencing lessons. Indeed, there is a reason Tremontaine is known as The Mad Duke. Within a week of arriving in the city, Katherine realizes fencing lessons aren’t that terrible; befriends Artemesia Fitz-Levi , the daughter of a well placed family; and learns that tromping around town in men’s clothes comes with social consequences. Within a month, she’s learned to ignore the names people call her, been befriended by the Duke’s young valet Marcus, learned something is very fishy with Artemesia’s cousin Lucius Perry who seems to have a secret life, and that Duke Tremontaine is much more than the local libertine, when it comes to subverting expectations. Thus begins Katherine’s 6 month whirlwind tour of how the world really works, leave your innocence at the door, thank you very much.